This malaria-free area of the Waterberg, South Africa, is home to a host of beautiful birds. Ornithologists and bird watching hobbyists alike are treated to more than 350 species on Kaingo. The plains, the waterways and variety of savanna types hold the greater abundance of species. 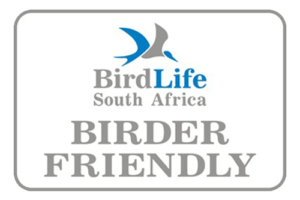 There are several special birds that we are privileged to see here such as African Finfoot, Narina Trogon and Striped Pipet. Our specialist guides, who know the habits and habitats of these birds, will do their utmost to get you a sighting of these birds in their natural environment. Whether you set out on a game drive, go on a guided walk or simply watch from your patio, bird watching is such a relaxing activity. In order to get the most from your safari experience, we highly recommend that you come fully prepared with your binoculars and bird guide. Our rangers are experts at navigating the Kaingo terrain and are readily available to answer any questions you may have. If there is a certain species you’re hoping to spot, or an area you wish to visit, chat to us to make arrangements.